With great sadness, The Lively Foundation announces the passing of Ann Woo. 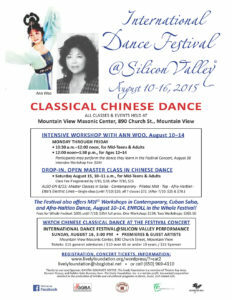 Ms Woo was a participant and supporter of the International Dance Festival@Silicon Valley. 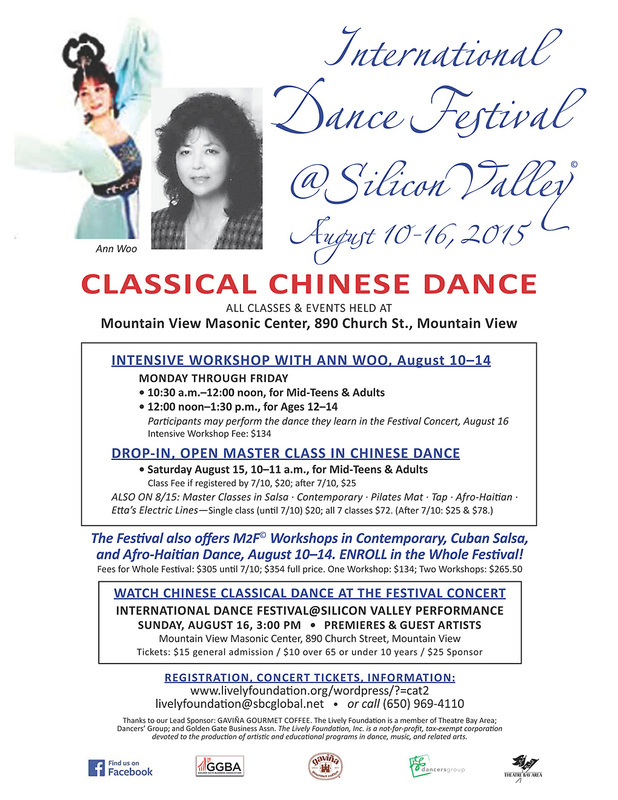 She taught a week long (M2F©) workshop and a class on Full Day of Dance© in Classical Chinese Dance, IDF@SV 2015. In addition, she choreographed a premiere work for her dancers to perform in the 2015 Festival Concert. It is a shock to realize she has been taken from us. 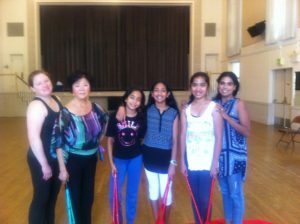 It was a special delight to offer her teaching Classical Chinese dance to both adults and young dancers, age 12 and up. She was an exceptional person in so many ways. She was the Founder and Director of CPAA, Chinese Performing Arts of America. She earned a Master’s Degree in Electrical Engineering and was a successful business woman in Silicon Valley. She has an incredible 9 patents to her name. When she studied EE at UC, Berkeley, she was the only woman out of 120 students! Ms Woo turned her energies to advancing the understanding of Chinese culture through the arts, especially dance. She received many awards. 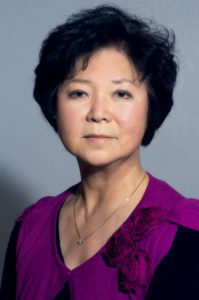 she was the Co-Founder of the Asian Heritage Council, Chair of Arts & Culture for the Cupertino-Hsinchu Sister Cities Association, Executive Director of the Chinese Folk Dance Association in San Francisco. Her company has performed in major theaters in San Jose and San Francisco, and she has been profiled by SPARK on KQED-TV. Ann Woo (2nd from left) with some of her students at IDF@SV, 2015. Usha Srinivasan, far right. Chinese Classical Dance has a very special way of moving that makes the dancer seem to glide through the air, just above the floor. Ann determined that her IDF@SV students would learn that and the beautiful manipulations of props, enormously long silk scarves or fans, which is an integral part of the dances. A personal note: I met Ann Woo through Usha Srinivasan, Founder & Director of Sangam Arts. Ann and I met and immediately hit it off. We shared personal and artistic values. Then, I learned that another friend, Leianne Lamb, had taken Chinese Folk Dance classes from Ann. So, although we saw each other far too seldom, there was a feeling of the net of community holding us together. When I saw her at her Center, she had beautiful roses from her garden on her desk. She loved her roses. She invited me to present my dance, Face to Face, a quartet, on her Gala Spring Festival. It was an honor to be part of this exceptional program which included music and dance of several different Chinese cultures. I admired her immensely hard work in establishing her Center and her dedication to expanding understanding through sharing culture. This is a very great loss. This entry was posted in Hedgehog Highlights, INTERNATIONAL DANCE FESTIVAL-SILICON VALLEY and tagged Ann Woo, Chinese Performing Arts of America, Leianne Lamb, Usha Srinivasan on August 26, 2017 by Leslie. Congratulations to Urmila Vudali for her remarkable performance, August 6, at the Cubberley Theater, Palo Alto. Her presentation of classical Bharatanatyam items was exquisite. Her footwork was especially admirable for clarity, quickness, and complete coordination with the orchestral and vocal accompaniment. Traditionally, the Bharatanatyam performer travels through specific types of dance in a prescribed order. The first half of Ms Vudali’s presentation followed that form beginning with the Pushpanjali, then the Varnam, and the Maiyya Mori. Pushpanjali offers flowers and asks the blessing of her lord, her guru and the audience. Her Pushpanjali ended with verses praising Saraswati, goddess of learning and music. The bright opening excited the onlooker to wonder if the artist’s first movements were so light and brilliant what more could come. The Varnam is the longest piece. This one included sketches of stories from epic tales of Indian liturgy and myth. It was challenging work for the dancer to represent both monsters and heroes while maintaining her own strength and grace. Devotion to Vishnu connects all the stories. The dancer needs to imagine herself in these characters in addition to enacting the movements that are supposed to represent the characters. Ms Vudali revealed she has that something extra that a classical dancer needs beyond technique. Draupadi is a princess in the Mahabharata. Her story is complex, but I have seen one particular drama represented in Bharatanatyam and Odissi dances. Draupadi is to be a prize bet on by her family’s enemies. The winner’s henchman is set to unwrap her sari. Draupadi pleads with him to stop and prays to Krishna, an avatar of Vishu, to rescue her. A miracle occurs: the man is able to unfurl the sari, but the folds of fabric will not stop piling up while Draupadi herself stays properly attired. While Ms Vudali performed, this audience member felt the terror and then the relief of Draupadi. What a triumph for a young artist to be able to transmit the heart of the story to the deeply engaged onlooker. It was no longer just a dance. Closing the first half, the Maiyya Mori, choreographed by Lavanya Ananth, is the popular story of Krishna as a child who has butter on his face but still tells his mother has not taken any butter. The interplay between the playful child and loving mother–both represented by Ms Vudali–was lighthearted and touching. The program was titled A Work in Progress. It suggests the artist is still striving toward perfection with the guidance of her guru and the support of her loving family. It also tells us about this exciting time in Urmila Vudali’s life as, at fourteen years old, she is becoming herself. We are all works in progress in that respect. An artist selects and must have the training to be able to select. We all make choices that shape our lives every day. 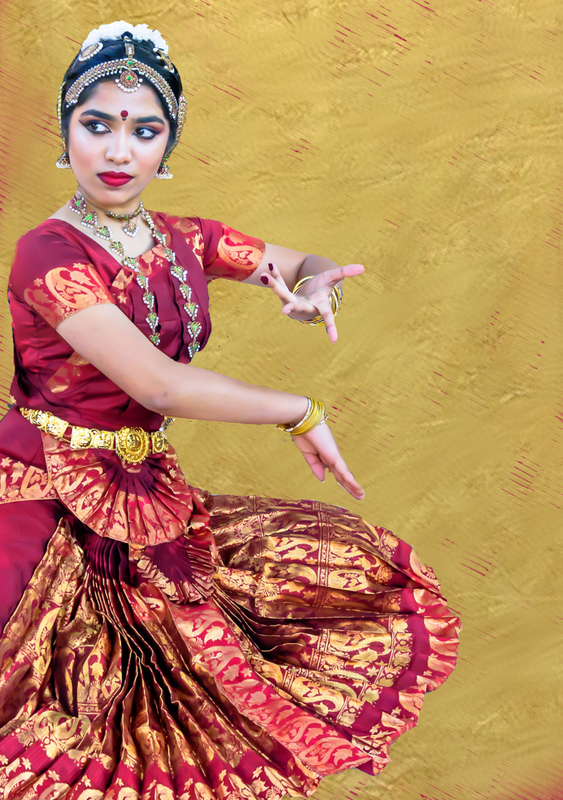 Congratulations to Sangam Arts and its President, Usha Srinivasan, for producing another program which honors an ancient tradition in the arts while also introducing the audience to the art of another culture. Ms Vudali’s guru, Navia Natarajan, is a greatly respected artist and teacher who divides her time between India and the Bay Area. She choreographed the Pushpanjali and Varnam as well as the dance, Baya’at Al-Ward (The Flower Seller), a charming piece set to an Arabic song about a girl selling flowers. It was accompanied by Lee Dynes, Oud, and Hannah Doughri, vocalist. In another cross cultural exploration, Ms Vudali was joined in two duets by Akhil Srinivasan Joondeph. Odissi is another classical dance form of India with movement styles different than Bharatanatyam. Odissi’s shapes are softer; the dancer’s body has a difficult posture to maintain following three sideways curves. It was very interesting to see the sharper, more percussive Bharatanatyam next to the Odissi which was so well represented by Mr. Srinivasan Joondeph. Having a duet of a male and female dancer gave dimension to the representations in Srita Kamala, the first duet, for example, of Vishu and his consort Lakshmi. The original choreography was by the great Odissi master, Guru Kelucharan Mohapatra. It was adapted as a duet by Niharika Mohanty, who is a premier disciple of Guru Kelucharan. The dancer appears as Vishnu fighting a giant snake and as Rama killing Ravana, a demon. Their second duet was the Thillana, the traditional closing dance. The dance celebrates lord Padmanabha, music and dance. Its Bharatanayam choreography was by Lavanya Ananth, and the Odissi by Niharika Mohanty. It was a pleasing visual harmony. The dances were accompanied by musicians from India: Srikanth Gopalakrishnan (vocal), B.P. Haribabu (mridangam), Kiran Athreya (violin), Mohan Raj Jayaraman (flute). Navia Natarajan played the nattuvangam and introduced each dance. The presence of the fine orchestra elevated our experience of the dancing. What a thrill to watch a young artist bringing her fresh energy to classical dance. Just as when you look at a young person you may see resemblances to her parents in her appearance, gestures, the way she speaks, to look at an emerging artist one may see the guru who brought her to this point, but also the guru’s own teachers and the teachers of the teachers’ teachers. As the dancer moves you will see her, the single artist, but the movement will let loose the shimmering, nearly transparent, dancing selves who are there in her present movements. When she makes one step, the Earth will move a little with the force of so many generations of artists stepping in her step and through her. It is the DNA of Dance itself. Classical Indian dance contains the life of a whole and diverse culture. It is the wisdom of guru Navia Natarajan to set the Bharatanatyam dance with Odissi, another dance tradition, and to another culture’s music. We all can learn from each other’s stories. We may even see our shared humanity in our universal, human longing to hear one more story before we go to bed. This entry was posted in Hedgehog Highlights and tagged A Work in Progress, Akhil Srinivasan Joondeph, B.P. Haribabu, Bharatanatyam, Hannah Doughri, Kiran Athreya, Lavanya Ananth, Lee Dynes, Mohan Raj Jayaraman, mridangam, nattuvangam, Navia Natarajan, Niharika Mohanty, Odissi, Sangam Arts, Srikanth Gopalakrishhnan, Urmila Vudali, Usha Srinivasan on August 9, 2017 by Leslie.